Dr. Albert Schweitzer, M.D. (January 14, 1875 – September 4, 1965), was a German theologian, musician, philosopher, and physician, renowned in the twentieth century as a humanitarian and advocate of peace. Schweitzer received the 1952 Nobel Peace Prize for founding the Lambaréné Hospital in west Africa and for serving as its physician, and for his “reverence for life” philosophy. Schweitzer was the principal of a theological college and author of a seminal work of biblical scholarship, The Quest for the Historical Jesus, which analyzed and effectively brought to a conclusion earlier studies of the Jesus of history. Schweitzer concluded that, rather than to atone for sin, Jesus sought to usher in the Kingdom of God and the end of history through his sacrifice on the cross. Schweitzer also gained a reputation as a prominent organist and musical theorist who scholarship and performances of Johann Sebastian Bach have made a lasting contribution. Schweitzer studied other world religions with sympathy. He was convinced that not only is all life sacred but that true Christianity, springing from the Spirit of Jesus, had yet to be developed. Schweitzer’s missionary work concentrated on service rather than conversion. His work in Africa inspired conservative Christians, particularly those who find kingdom-building rather than soul-winning more attractive. "The only ones among you who will be really happy," Schweitzer said, "are those who will have sought and found how to serve." Albert Schweitzer was born in Kaysersberg, Alsace-Lorraine, Germany (now part of Haut-Rhin, Alsace, France). 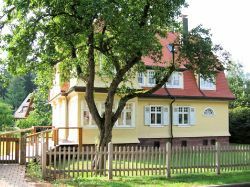 He spent his childhood in the village of Gunsbach, Alsace, where his father was pastor of the reformed liberal protestant Alsace Free Church, (later absorbed by the German Lutheran Church in 1871). 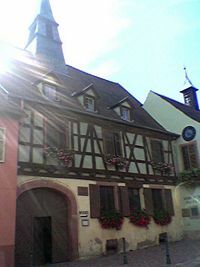 The Gunsbach parish church was an unusual Protestant-Catholic church found particularly in Alsace, shared by the two congregations, which held their prayers at different times on Sundays. Schweitzer, the pastor's son, grew up in this exceptional environment of religious tolerance and developed the belief that true Christianity should always work toward a unity of faith and purpose. Schweitzer was deeply influenced by his father, who in addition to a broad-minded perspective of faith taught his son how to play music. When Schweitzer was 10 years old, he attended the well-regarded local school in Mulhouse and lived with his elderly relatives, from whom he acquired a stern ethical code and rigorous scholarly habits. Schweitzer's initial career choice was music. At the age of 18, he studied under several renowned masters both in Alsace and Paris, before deciding to become a pastor like his father. He switched to theological study, attending Strasbourg University from 1893. A brilliant student, he earned doctorates in philosophy (1899) and in theology (1890). Schweitzer particularly studied the thought of Friedrich Nietzsche and Leo Tolstoy, rejecting on one hand Nietzsche's doctrine of the "overman" who could transcend moral laws, while attracted to Tolstoy's doctrine of love and compassion. Schweitzer's most important interest, however, was the life of Jesus, to which he devoted years of research and reflection. Schweitzer later served as pastor to a reformed congregation at St. Nicholas church, where he blessed the wedding of Theodor Heuss, who became the first president of the Federal Republic of Germany. In 1901, following the publication of his book, The Secret of the Messiahship and the Passion: A Sketch of the Life of Jesus, he was appointed Principal of the Theological Seminary at Strassbourg. In 1905, Schweitzer published a biography of Johann Sebastian Bach and in 1906, published what would prove to be his seminal work, The Quest of the Historical Jesus. The book surveyed the scholarly attempts from the seventeenth century to critically examine the life of Jesus and alone would have secured him an academic reputation sufficient to ensure a respectable career. One morning in 1905 Schweitzer, then a charismatic and successful writer, cleric, musician, and lecturer with brilliant future prospects, experienced a profound religious revelation calling him to renounce worldly success and devote himself to the betterment of humankind. At age 30, Schweitzer answered the call of The Society Of The Evangelist Missions of Paris, who were looking for a medical doctor. He later wrote that the parable of Dives [rich man] and Lazarus had spoken to him. Europeans were "Dives," Africans were "Lazarus;" Dives had medical knowledge which he took for granted, while Lazarus suffered from illness and pain but has no doctors to help him. He planned to spread the Gospel by the example of his Christian labor of healing, instead of through the evangelical process of preaching, and believed that this service should be acceptable within any branch of Christian teaching. However, the committee of this (Roman Catholic) French Missionary Society was not ready to accept his offer, considering that his Lutheran theology was "incorrect". He could easily have obtained a place in a German Evangelical mission, but wished to follow the original call despite the doctrinal difficulties. Amid a hail of protests from his friends, family and colleagues, he resigned his post and re-entered the University as a student in a punishing seven-year course towards the degree of a Doctorate in Medicine, a subject in which he had little knowledge or previous aptitude. In 1911 he married Helene Bresslau, a professor's daughter who had studied nursing in order to work at his side in Africa, and earned his medical degree in 1912. He traveled in 1913 to central Africa, where he built his own hospital at Lambaréné in what is now Gabon, having raised his own funds. Schweitzer spent roughly 42 years of his life in Lambaréné, spending fourteen periods there (1913-1917; 1924-27; 1929-1932; 1933-34; 1935; 1937-39; 1939-49; 1949-51; 1951-52; 1952-54; 1954-55; 1955-57; 1957-59 and finally from 1959 until his death). He treated and operated on thousands of people. He took care of hundreds of lepers and treated many victims of the African sleeping sickness. Over the years other doctors joined him. Who can describe the injustice and cruelties that in the course of centuries they [the coloured peoples] have suffered at the hands of Europeans? … If a record could be compiled of all that has happened between the white and the coloured races, it would make a book containing numbers of pages which the reader would have to turn over unread because their contents would be too horrible. Many accounts, such as Schweitzer chronicler and filmmaker Erica Anderson's (1966), attest to Schweitzer’s amazing work ethic and untiring passion for his work. She observed that “every day, Schweitzer is the first one up, the last to bed…he is untiringly at work” (116). Anderson’s documentary film on Schweitzer won the 1958 Academy Award for best non-fiction film. During World War I, Schweitzer and his wife returned to Europe due to ill health and were held as prisoners of war in France. In 1924 they returned to Lambaréné, where their daughter, Rhena, was born on her father's birthday in 1919. He returned to Lambaréné from 1929-32, visiting Europe again in 1932-33 for speaking engagements and fund-raising organ recitals. In 1933 and 1934, he was back in Africa, then during 1934 and 1935, he presented the prestigious Hibbert and Gifford Lectures in the United Kingdom. Schweitzer returned to Lambaréné in February 1935. From 1935 to 1937 he gave a second round of Gifford Lectures in the United Kingdom and recorded organ performances for Columbia Records. The years 1937-1939 saw his sixth stay at the hospital. He traveled to Europe in 1939 but immediately returned to Lambaréné to avoid a repetition of his internment during the First World War. From 1939 to 1948 he stayed in Lambaréné, unable to go back to a Europe during the war. In 1948, Schweitzer returned to Europe, and made one trip to the United States, where he was awarded an honorary doctorate from the University of Chicago. After World War II Schweitzer used his reputation to campaign against nuclear arms. He was deeply shocked by the 1945 atomic bombings of Hiroshima and Nagasaki and in 1957 launched a global appeal called A Declaration of Conscience. Schweitzer was a co-founder of The Committee for a Sane Nuclear Policy. He collaborated with such eminent peace-activists as Bertrand Russell and Albert Einstein in working for a test-ban treaty. His fame continuously grew, and celebrities flocked to see him at Lambaréné much as later generations would travel to see Mother Teresa of Calcutta (1910-1997). However, Schweitzer remained somewhat shy and diffident, and did not much like to be photographed. "My trouble," complained Erica Anderson, "is that Schweitzer is really very camera shy, always stiffening up and posing…. I wonder if I'll ever get him on film as he really is." "I don't think he's aware of his own importance," said Anderson's financial backer, Jerome Hill. Another writer on Schweitzer, Gerald McKnight, remarked, "The first meeting is unforgettable…. Nobody can meet Schweitzer without liking him, without responding to some instinctive respect and regard for this great individual. His power to disarm remains immense." Schweitzer continued traveling back and forth to Lambaréné as long as he could. In 1954, he accepted the 1952 Nobel Prize in Oslo, Norway. Characteristically, he used the $33,000 cash award to build a leper colony at his hospital. He made his fourteenth and final trip to his beloved Lambaréné in 1959, staying until his death in 1965. His wife, due to ill health, did not accompany him on all his sojourns at Lambaréné and they kept a house at Gunsbach, where his father had been pastor for 50 years. After her father died, Rhena Schweitzer Miller continued to run the hospital he had founded. As a young theologian he published The Quest of the Historical Jesus (1906), a landmark work by which he gained a great reputation. (The original edition was translated into English by William Montgomery and published in 1910. A second German edition was published in 1913, containing theologically significant revisions and expansions. This revised edition did not appear in English until 2001.) In this book, he interpreted the life of Jesus in the light of Jesus' own apparent eschatological convictions. Schweitzer demonstrated that the 19th century historical studies of Jesus were largely reflections of the authors' own historical and social contexts. This work effectively ended for decades the so-called Quest for the Historical Jesus as a subdiscipline of New Testament studies, until the development of a "Second Quest," among whose notable exponents was Rudolf Bultmann's student Ernst Käsemann. Schweitzer's theology demanded the most accurate historical picture possible. He became focused on the study and cross referencing of the many Biblical verses promising the return of the Son of Man and the exact details. Schweitzer believed, following Johannes Weiss (1863-1914), that while the Jesus of the nineteenth century liberals, who had taught timeless truths and a spiritual kingdom, was attractive, this could not be derived from what Jesus had really taught. What the liberals had done was to dress Jesus in their own clothes. Jesus was an apocalyptic prophet, Schweitzer said, who anticipated the imminent End of the World and who had no interest in establishing either an earthly kingdom of peace and justice or in a spiritual after-life. He expected the end of history as we know it. In fact, said Schweitzer, Jesus willingly went to the cross not to expiate human sin but to usher in the kingdom. Schweitzer notes that Saint Paul speaks of Jesus’ promise of a prompt return, in the First Century. Paul states that it will be at a time when "… we also … are still alive." Schweitzer claims that genuine first century theology specified a first century fulfillment of Jesus' promise. Since then, however, each generation of followers anticipates that their generation will be the one to see the world destroyed, another world coming, and the saints governing a new earth. Schweitzer realized that critical First Century theology verses had later been ignored by the faithful. He concluded that the beliefs originating in the lifetimes of those who first followed Jesus are far removed from those beliefs later made official in Nicaea, almost 300 years later, under Constantine. Schweitzer observes that the variations of Christianity that now exist in modern times contradict the urgency of what Jesus originally proclaimed. Schweitzer established his reputation further as a New Testament scholar with other theological studies including his medical degree dissertation, The Psychiatric Study of Jesus (1911). The same period saw his first (of several) published study of the apostle Paul, Paul and his Interpreters, thoughts which reached maturity in The Mysticism of Paul the Apostle (1930). This examined the eschatological beliefs of Paul and through this the message of the New Testament. He comes to us as One unknown, without a name, as of old, by the lakeside, he came to those who knew Him not. He speaks to us the same word: "Follow thou me" and sets us to the tasks which He has to fulfill for our time. He commands. And to those who obey Him, whether they be wise or simple, He will reveal Himself in the toils, the conflicts, the sufferings which they shall pass through in His fellowship and, as an ineffable mystery, they shall learn in their own experience, who He is (403). 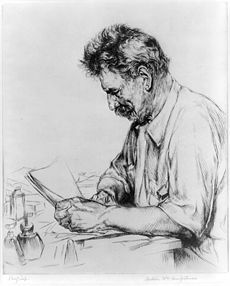 Albert Schweitzer's immense stature as a humanitarian and medical missionary has largely overshadowed his contributions as a musician and musicologist. Yet from his years at Strasbourg University and later years in Africa, Schweitzer made important contributions as a performer and theorist, particularly of the works of Johann Sebastian Bach. Schweitzer was among the six musicians who founded the Paris Bach Society, a choir dedicated to performing Bach's music and for which Schweitzer performed the organ part regularly until 1913. He was also appointed organist for the Bach Concerts of the Orféo Català at Barcelona and often traveled there for the purpose. He also collaborated on a new edition of Bach's organ works, with detailed analysis of each work in English, French, and German. Schweitzer, who insisted that the score should show Bach's notation with no additional markings, wrote the commentaries for the Preludes and Fugues. Six volumes were published in 1912-14; three more, to contain the Chorale Preludes with Schweitzer's analyses, were to be worked on in Africa but were never completed, perhaps because for him they were inseparable from his evolving theological thought. While in Paris, and finding contemporary organs unsuited to the performances of Bach's counterpoint, Schweitzer began a study of organs and the art of organ building, all the while continuing preparations for establishing a hospital in Africa. During these preparatory years, he authored his masterly study J. S. Bach: Le Musicien-Poète, published in French in 1905. There was a great demand for a German edition, but instead he rewrote it in two volumes, J. S. Bach, in German, which were published in 1908, and in an English translation by British critic and writer Ernest Newman in 1911. Schweitzer's interpretative approach greatly influenced the modern understanding of Bach's music. Schweitzer explained figures and motifs in Bach's Chorale Preludes as painter-like tonal and rhythmic imagery, illustrating themes from the words of the hymns on which they were based. They were works of devotional contemplation, he said, in which the musical design corresponded to literary ideas, conceived visually. Schweitzer's pamphlet "The Art of Organ Building and Organ Playing in Germany and France" (1906, republished with an appendix on the state of the organ-building industry in 1927) effectively launched the twentieth-century Orgelbewegung, which turned away from romantic extremes and rediscovered baroque principles—although this sweeping reform movement in organ building eventually went further than Schweitzer himself had intended. In 1909 he addressed the Third Congress of the International Society of Music at Vienna on the subject. Having circulated a questionnaire among players and organ-builders in several European countries, he produced a very considered report that provided the basis for the International Regulations for Organ Building. He envisaged instruments in which the French late-romantic full-organ sound should work integrally with the English and German romantic reed pipes, and with the classical Alsace Silbermann organ resources and baroque flue pipes, all in registers regulated (by stops) to access distinct voices in fugue or counterpoint capable of combination without loss of distinctness: different voices singing together in the same music. The Choir Organ at St Thomas's Church, Strasbourg, designed in 1905 on principles defined by Albert Schweitzer. On departure for Lambaréné in 1913, he was presented with a piano with pedal attachments (to operate like an organ pedal-keyboard). Built especially for the tropics, it was delivered by river in a huge dug-out canoe to Lambaréné, packed in a zinc-lined case. At first he regarded his new life as a renunciation of his art, and fell out of practise: but after some time he resolved to study and learn by heart the works of Bach, Mendelssohn, Widor, César Franck, and Max Reger. It became his custom to play during the lunch hour and on Sunday afternoons. Schweitzer's piano-organ was still in use at Lambaréné as late as 1946. Schweitzer also continued to spend time in Europe, presenting organ recitals and accepting engagements as a lecturer and rapidly gained prominence as a musical scholar and organist. Schweitzer earned his Ph.D. in philosophy at the University of Tübingen in 1899. The same year he published The Religious Philosophia of Kant and in 1923 The Philosophy of Civilization, a comprehensive historical overview of ethical thinking from Socrates (c. 470-333 B.C.E.) to Henri-Louis Bergson (1859-1941). In this work, Schweitzer argued that no thinker of the past had offered a workable system of ethics. Life and love in his view are based on the same principle: respect for every manifestation of life, and a personal, spiritual relationship toward the universe. Ethics, according to Schweitzer, consists in the compulsion to show to the the same reverence for the will-to-live of each and every being as one does to one's own self. Circumstances where we apparently fail to satisfy this compulsion should not lead us to defeatism, though, since the will-to-live renews itself again and again, as an outcome of an evolutionary necessity and a phenomenon with a spiritual dimension. Schweitzer saw similarities between the reverence for life that he derived from Jesus and in all religions that profess the ethic of love. Reverence for life was universally true, he believed. Speaking to students of mission at the Selly Oak Colleges, Birmingham, on world religions in 1923, he described Christianity as the “deepest expression of the religious mind,” but said that if missionaries could show people of other faiths “…what it means to be apprehended by the living, ethical God,” then they would know “something of the truth of Jesus” for themselves (1923: 92-93). Schweitzer advocated the concept of reverence for life widely throughout his entire life. His believed that Western civilization was in decay because it was gradually abandoning its ethical foundations grounded in affirmation of life. But he looked forward to a renewed enlightenment of humanity, more profoundly aware of its position in the universe (a view he expressed in the epilogue of his autobiography, Out of My Life and Thought). He persistently emphasized the necessity to think and reflect, rather than merely act on the basis of widespread opinions. Respect for life, resulting from contemplation on one's own conscious will to live, he believed, leads the individual to live in the service of other people and of every living creature. Schweitzer was much respected for putting his theory into practice in his own life. He loved animals, and many pets and wild creatures roamed the grounds of his hospital. Like legends of St. Francis, “the moment Schweitzer is out of the door, animals and birds come swarming to him in every direction—cats, dogs, chickens, goats, and ducks” (Anderson 1966, 40). In 1963 he supported a U.S. Senate bill to limit animal experimentation. Living through the carnage of World War I, the rise of totalitarianism, and the atrocities of Nazi Germany, Schweitzer answered though an example of service to others in remote Africa, practicing a "reverence for life" that awoke the conscience of the world. His recognition of the sacred value of all life, including plants and animals, anticipated later environmental movements. Although he didn't seek recognition, he used his enormous moral stature late in life to call for nuclear disarmament and the end of war as a method of settling disputes. Schweitzer's Quest remains a standard text for Jesus' studies. His book ended a epoch of historic studies of the life of Jesus, and later became the starting point for a new search for the Jesus of history. He was chevalier of the Military and Hospitaller Order of Saint Lazarus of Jerusalem, and a Member of the British Order of Merit (1955). He was awarded honorary doctorates from the universities of Zurich (1920), Edinburgh (1929), Oxford and St. Andrews (1932), Chicago (1949), Marburg (1952), Kapstadt (1953), Cambridge (1955), and Munster and Tubingen (1958). 1948-1965 - Lambaréné and Europe. Christianity and The Religions of the World. New York: George H. Doran & Co, 1923. On the Edge of the Primeval Forrest. New York: Macmillan, 1956. Reprinted 1998: Baltimore, MD: John Hopkins University Press (referenced in above article as 1998b). Indian Thought and Its Development. London: Hodder & Stoughton, 1936. The Kingdom of God and Primitive Christianity. New York: Seabury Press, 1966. ↑ G. Seaver, Albert Schweitzer—The Man and his Mind (London: A. & C. Black, 1951), 3-9. ↑ Schweitzer.org, Family tree. Retrieved December 10, 2008. ↑ Schweitzer, My Life and Thought, 80-81. ↑ Mark D. Isaacs, "Blessed are the Peacemakers: Albert Schweitzer as Exemplar," Journal of Unification Studies Vol. IX, 2008: 119. Allen, Charlotte. The Human Christ: The Search for the Historical Jesus, NY: The Free Press, 1998. ISBN 0745942350. Anderson, Erica. Albert Schweitzer's Gift of Friendship. London: Robert Hale, 1966. Bennett, Clinton. In Search of Jesus. New York: Continuum, 2001. ISBN 0826449166. Berman, Edgar. In Africa With Schweitzer. Far Hills, NJ: New Horizon Press, 1986. ISBN 0882820257. McKnight, Gerald. Verdict on Schweitzer. London: Frederick Miller, 1964. Miller, Robert J (ed.). The Apocalyptic Jesus: A Debate. Santa Rosa, CA: Polebridge Press, 2001. ISBN 0944344895. Weiss, Johannes. Jesus' Proclamation of the Kingdom of God. Philadelphia, PA: Fortress Press, 1971 (first published in German, 1892). This page was last modified on 18 February 2019, at 20:50.